Manley 35 and 50 Watt Monoblocks and Tiny Triodes — Manley Laboratories, Inc. These compact gems produce 50 watts RMS from a quartet of EL84 / 6BQ5 tubes driven by a 6414 dual triode driver and a 12AT7WA input dual triode. The Ei Yugo EL84 has been one of our very favorite tubes for many years, extremely long lasting and reliable, and can be considered the smaller brother of the much beloved EL34: really quick-sounding both in the bass and especially in the top end. And of course this has a lot to do with the Manley Output transformer. After the introduction of the Stingray Integrated amplifier in 1998, we then went back and incorporated these new design changes into the 50 Watt Monoblocks. Finally, big bass out of a small amplifier! So, topology-wise, these 50 watters are the monoblock version of the stereo Stingray, with the additional variable feedback feature. These amplifiers may also be ordered hard-wired in ultra-linear or triode operation. Each mode has its fans so we'd have to answer that the jury is still out as to which is "best". Please feel free to consult your dealer or the factory for advice pertaining to your specific system's needs. We believe the MANLEY 50 Watt amplifier gives a lot of value for an affordable price and we think you will be surprised at just how big these little guys sound. The first EL84-based MANLEY monoblocks were re-branded VTL Tiny Triodes, basically the same amp as the VTL version with a different faceplate, and a "Manley Blue" chassis cover, in all honesty. They were built at the VTL factory in the early 1990's. In early 1993, David Manley tried to launch a factory in Spain. A few of these Tiny Triodes got built there in a different chassis. That Spanish factory idea came and went. In April 1993, Manley and VTL split up and the Manley Labs factory in Chino, where we still are today, was created. The Tiny Triode was re-formed again, this time as an Ultra-Linear amp called the Manley 35 Watt Monoblock. Here's a super rare vintage 1993 one-off 35W mono built in a Paduk wooden chassis! Cool! It belongs to JJ Blair in Hollywood. He uses it in his studio. It has a variable feedback switch. This was the production version of the Manley 35 watt monoblock. The oldest ones, built in 1993 at the Manley Labs factory, were the follow-on model from the Tiny Triode and were basically the same amplifier in a different chassis, also using the same Mercury Magnetics MLO-40 output transformer, but larger B+ caps than the TT. At some time during the 2 year production, (not sure exactly when), the output transformer changed to a split bobbin design manufactured at Manley Labs. You can look inside and see for yerself what you have easily enough. The 35's were usually strapped to run in UL mode (Ultra Linear) but could be ordered to run in Triode. Serial numbers ran MANEM35001 - 256, production was from September 1993 through May 1995. The 50 watt monos were the follow-on model to the 35's. The chassis employed the same extruded side-members we use in all our pro gear units. All the output transformers were made at Manley Labs. There was a three position variable feedback switch on the faceplate. Units could be optionally ordered strapped to triode or with triode-UL switches. 24K Gold Plated version 50W mono was available by special order. Serial numbers for "Series 1" 50 watt monos ran MANEM35257 - 412 Excluding 385, 386, & 407 Production was from July 1995 through March 1999 From July 1995 until April 1997 most the faceplates were "Manley Blue"; the chassis black. There was an overlap period between the gold and blue periods. From February 1996 until the end of 2001 most units shipped with stainless-steel chassis and gold faceplates. In April 1999 units started shipping with the input driver stages same as the newly developed Stingray and the newer output transformer developed for the Stingray. Basically a monoblock version of the Stingray. Serial numbers for "Series 2" 50watt monos ran MANEM35413 - 494 and 385, 386, & 407. Production was from April 1999 through February 2003 From February 1996 until the end of 2001 most units shipped with stainless-steel chassis and gold faceplates. By September 2001 no more gold units were shipping and we went back to the Manley Blue cosmetic scheme. 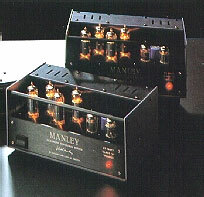 The last Manley 50 watt monoblocks shipped in February 2003. This 50 watt model was discontinued and replaced by the MAHI. This is an inside view of a 1996 production Manley 50 Watt Monoblock.